Men’s Tank Top with racer back is in stock. We will print it as soon as you order it. 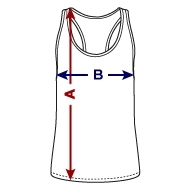 Sporty tank top with low-cut shoulders that show off flexed arms quite nicely. Suited for work out and sunny days alike. Racer back with centred straps that leave the shoulders bare. Solarstone Pure Trance Tanktop, standard quality & fit. Navy Blue/White Print & Logo in Silver Metallic *You can change the colour of the garment.